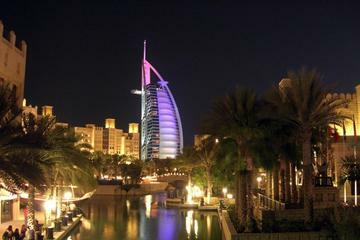 Entdecken Sie die Stadtlichter und innovative Architektur Dubais bei Nacht auf dieser 4-stündigen Besichtigungstour. Erleben Sie die Stadt aus einer anderen Perspektive, wenn die Türme, Sehenswürdigkeiten und Wahrzeichen in ihrer Nachtbeleuchtung zum Leben erwachen. Erkunden Sie die Kanäle im alten arabischen Stil sowie die Wege des Madinat Jumeirah, spazieren Sie entlang des Dubai Marina Walk am Fuße der beleuchteten Wolkenkratzer und genießen Sie das in tausend flackernden Lichtern erstrahlte Burj Khalifa und die Dubai Wasserspiele. Abholung vom Hotel und Transfer zum Hotel im Preis inbegriffen. Good Guide. Just that pick up was 1 hour later than stated.The Water Fountain show was marvellous as well as the laser show, timing well informed by the Guide. This was a great way to make a quick tour of the sights in Dubai. Although the trip was short, it was still worth it especially for those who aren't staying long in Dubai. We had 3 stops. 1. Visiting a shop for selling carpets. 2. Visiting inside a tourist medina. 3. Dubai Mall. 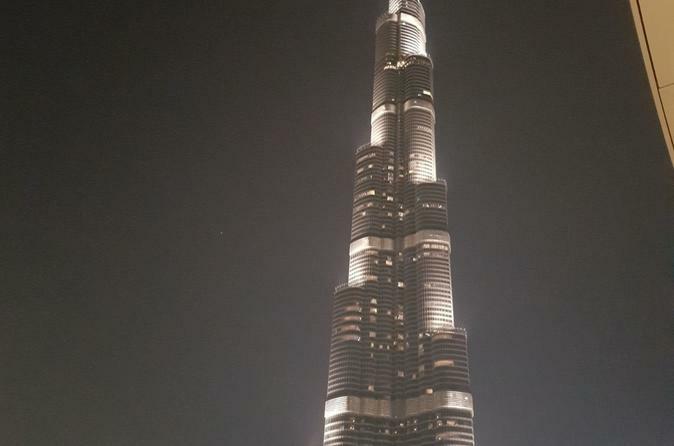 1. and 2. had Notting to do with a Dubai by Night City Tour. Very disappointed. We were picked up an hour late due to some guests being late, surely they should have gone without them, instead of making other guests be picked up late! This made us miss the sunset when we got to the beach near the Burj Al Arab. We visited the Souk at the Madinat, the Marina and then onto the Dubai Mall so we could see the fountains. I would definitely recommend this trip as you get to see everything lit up at night and an insight into the shopping areas. Too much time visiting shops and not enough city sights. Saw only marina in daylight, photo opportunity at Al Arab and Dubai fountains. Guide seemed distracted. Far too long at shops of his friends. She gave a running commentary the whole time with the history and locations of various sights. It was evening so we saw everything lit up so nicely. And it was a bit cooler. 38'C was a real experience too! You really can't function too well in this heat so the aircon was a blessing. The amount you see in the time frame was perfect. Expect to walk at a reasonable pace. You also get a 15 minutes here and there to hop off and walk around and take pictures. We saw all the major sights and caught the fountain light show in front of the Burj Khalifa. To end we had a bite to eat after being dropped off at our hotel again for a sleep and early flight. This was the perfect combo. If you have longer than an 8 hour layover, I recommend this highly if you've never seen Dubai before and may not see again.